Context: Visited the Christmas Fayre at Bury St Edmunds while reading this. 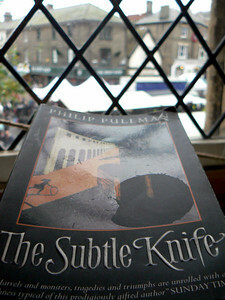 This is the second book in Pullman’s His Dark Materials trilogy. I read the first, Northern Lights (aka The Golden Compass in the US) in August last year and thought it was okay. I was interested to see where this book went after the first as I’d heard that the trilogy simply gets darker as it goes on. Having now read the second book, I think most of what I’ve heard must occur in the third book which sits on my shelf. We shall see. Subtle Knife doesn’t pick up directly where the first book leaves off. The first book stayed entirely in Lyra’s world. But as the boundary between that world and the hundreds of others was rent at the end of the book, this book begins in one of those other worlds. It happens to be ours. And a new character is introduced who become Lyra’s partner in arms as they both battle their way through the mystery that their lives have become and realise that they share a destiny that will, undoubtedly, be realised in book 3. The book is written in the same style as the first which suits teens more than any other age group. Not really my thing but if you’re into Potter you’d like it. The story is a little less gripping than that of the first book. This is a typical weakness of a trilogy so I kind of expected that. There are a couple of interesting twists and one fairly gruesome bit which made me feel a bit queasy so Pullman can spin a yarn and engage his readers. What about his views on Christianity? Well, first let me say that I am a supporter of Christ, I’m not such a big fan of the church. So, I take on board and consider valid, Pullman’s message that the church as an institution is in the business of protecting itself. This is the truth and does the cause of Christ no service. However, where Pullman misleads is in equating God with his church. It seems a fundamentally naive view to compare any human institution with a form of diviniity as if one could ever be a worthy representation of the intents and purposes of the other. And a bit more naivety comes in as the plot seems to be developing toward an assassination attempt on God himself. Yawn…. where did Pullman get that idea from? The Gospels perhaps? As we know from history, you can’t keep a God-man down. And will looked from them to Lyra’s rucksack and back again, and he didn’t hear a word they said.